Nervous by temperament, often violent, revolutionary in his way of painting, Caravaggio personifies in every aspect of his eventful life the romantic figure of the damned artist. Born in Milan, he worked mainly in Rome, Naples, Malta and Sicily. His training was strongly influenced by Venetian and Lombard painting: from the first, he learned the use of the color, from the second, he learned the deep realism and the preference for humble and popular subjects. 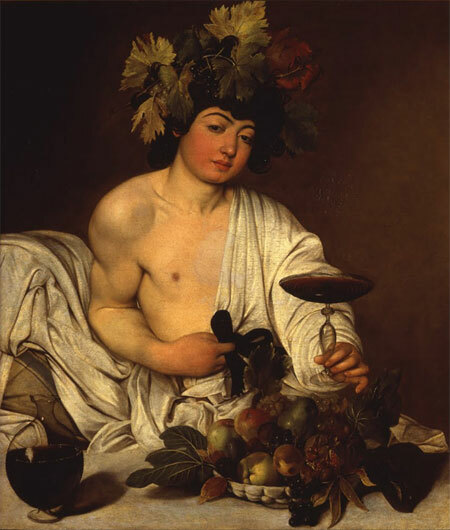 This last feature is observable in the famous Bacchus conserved at the Uffizi, commissioned by his patron Cardinal del Monte as a gift for the Grand Duke of Tuscany Ferdinand I and painted between 1596 and 1597.